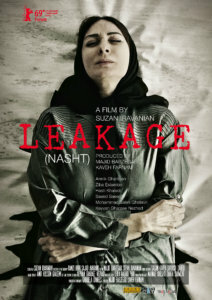 At this year’s 69th Berlin International Film Festival (IFBB), ArtHood Entertainment GmbH became the worldwide distributor of the film „Leakage“ / „Nasht“ by Iranian director Suzan Iravanian. The Iranian director’s feature film debut explores migration, human exploitation, and the ever-present oil in a visually stunning manner. January 21, 2019 – Made in cooperation with Czech production and post-production companies, the Iranian film has been selected as part of the Forum section for the 69th edition of the Berlin International Film Festival. Migration, the role of women in society, and the world’s obsession with oil. Suzan Iravanian’s directorial feature debut manages to touch on big subjects while remaining a refreshingly civil piece of cinema. The 104 minutes long play on language, music, sound and stunning visuals delivers a powerful message and builds on outstanding acting performances led by the talented Armik Ghabirian who entered the production with little theatrical experience and no experience in screen acting. However, Iravanian was convinced she was the right choice – and was proved right. “The film’s real motivation comes from a short story that I wrote for a competition arranged by my creative writing tutor at Oxford University,” explains Suzan Iravanian. In 2015, she began expanding it into a script for a feature film. Despite Tehran being the world-renowned hub for the Iranian filmmaking industry, Iravanian decided to start the production in her hometown of Shiraz. Starting off with a low budget, Iravanian later met Majid Barzegar – an award-winning director, writer and producer – and Kaveh Farnam – an award winning producer and CEO of Prague-based production company Europe Media Nest. Suzan Iravanian and her international crew, including Lebanese DoP Ramzi Hibri, were finally able to focus on telling the story of Foziye whose struggles include facing bureaucracy, complicated family relationships, the mysterious loss of her husband, as well as what she calls her “special condition”: her body producing crude oil. While still in post-production (which took place partly in Prague, including VFX done by the Magiclab studio), an excerpt from Leakage was presented in 2018 as part of the ‘Works in Progress’ category at the Karlovy Vary International Film Festival, allowing it to meet the European audience for the first time. In 2019, the film was selected to take part in the Forum section at Berlinale where it will also see its world premiere. Apart from aspiring to be distributed worldwide, the most important market for Leakage is still the Iranian one. The producers are determined to try and get permission to screen from the country’s authorities. Ideally, they would like to premiere the film in autumn 2019. Born in 1985 in Shiraz, Iran, Suzan Iravanian holds a BA in Art and Architecture and an MA in Cult Film from Brunel University as well as an MA in Filmmaking from the New York Film Academy. Since 2009, Iravanian has been involved in the production of short films. In 2015, she started working on her first feature film, Leakage, premiering at the 2019 Berlinale. She is also a writer, photographer and graphic designer. The 4th Character, 2009, 4 min. Writer, director and editor. The Floating Volume (Hajme shenavar), 2009, 10 min. Writer, director and editor. Songs from the Layers of Language, 2009, 20 min. Writer, director and editor. Found Its Way (Sakhtarhaye napeyda), 2013, 60 min documentary. Lead editor. Leakage (Nasht), 2018, 104 min. Writer, director and editor. The Hybrids, 2018, 60 min documentary. Director and editor.